When you think of getting a massage, you might think of an hour-long process where you are lying on a massage table, having your full body treated by a professional licensed massage therapist. Often times you might not make time for a massage as often as you would like to, and you find yourself getting stressed and tense in between your massages. As a result, some people have found that a chair massage is a good way to bring relaxation into their lives on a more regular basis, without requiring as much time or money as the full-body massage. A chair massage is a shoulder, neck, and upper back massage that takes place in a specially designed chair. The massage might also include the arms and hands and part of the lower back. This type of massage generally does not manipulate muscles deeply like a full-body massage, but it is designed to relax the muscles and improve flexibility and movement. Typically a chair massage lasts 15-30 minutes, and is usually billed by the minute—some LMTs charge $1 per minute. Others may charge slightly more or less. You might see chair massage practitioners in airports, shopping malls, corporate offices, or even grocery stores. Many people find that these are ideal places to take a few minutes for yourself, and help relieve your tensions. 1. It’s faster and less expensive than a full-body massage. Many chair massage practitioners charge $1 per minute, and offer sessions lasting in the range of 15-30 minutes. If you don’t have time in your schedule for a full-body massage, this may be a good alternative. 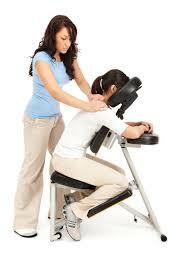 Chair massage is often set up in places where people are feeling rushed or stressed, like your place of employment. Just 15 minutes out of your day can help alleviate your stress and increase your sense of well-being. 3. It’s no-fuss and simple. Chair massages can be done “on the spot” in usually about 15 minutes since you don’t lie down or change your clothes. Our LMT’s are happy to discuss with you the option of bringing chair massages to your office, for your wedding party and more!